in General Headquarters opened " Edgar Degas . The figure in the movement, " prepared by the State Hermitage Museum and the Foundation named after M. T. Abraham , Paris , France. Degas , who became famous for his paintings , drawings and pastels depicting dancers and nudes , showed the audience during his lifetime only one sculpture. And this sculpture that struck contemporaries and adopted them ambiguous , largely determined the further development of art . The exhibition presents more than 30 works . 42 more exhibit on display at the Hermitage Storage Facility , in the old village . Hilaire -Germain- Edgar de Haas ( 1834-1917 ) , who later became known under the name of Edgar Degas , first began to sculpt sculpture of wax around 1860 . Many of them were created by an artist at the same time with its famous paintings and drawings . "Little fourteen- dancer " - the most important of his wax sculptures - was presented in Paris at the sixth Impressionist exhibition in 1881, which caused a sensation . 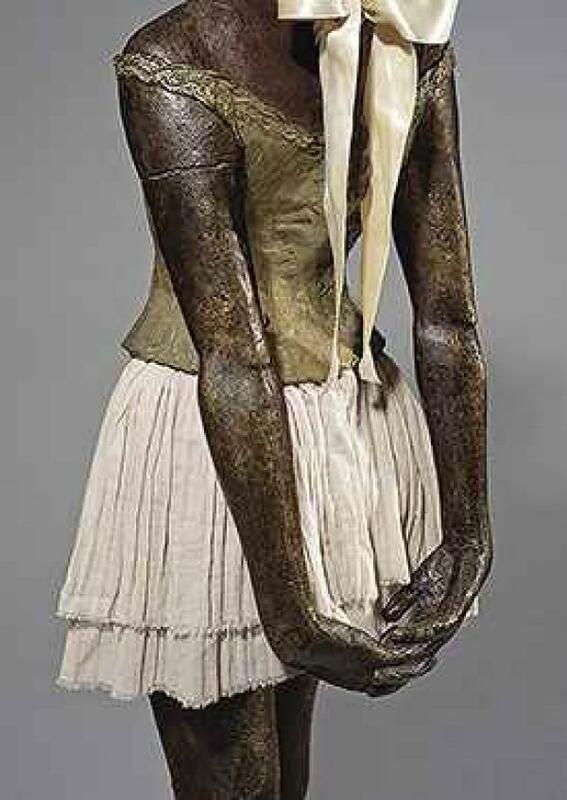 While some critics praised the work of a very positive , most responded with hostility and negative, resulting in this work remained the only sculpture Degas exhibited in his lifetime . Degas 's interest in sculpture began to develop from mid 1850 - ies and is associated with an extremely important topic for his art movement. Degas loved horse racing , thinking about the motion of the horses , he realized that for the study of postures moving horse best suited dimensional graphic means - only sculpture can pass them with precision. Having considered the various options sculptural materials , Degas decided that the best fit for its purpose wax, sometimes mixed with soft clay model . This material provided him with the necessary freedom of action and subsequently allowed to refine and customize their studies . Early Degas sculpture horses were fairly static. This is beginning to change with the 1860 mid -x 's, when Degas obviously saw the pictures E.-ZH. Mare who committed gaits horses. The next step came in the late 1870s , when the British photographer E. Meybridzh revolutionized the photography for his series "The movement of animals ." It was the first milestone in the history of the still pictures demonstrate the exact position of the animal's body , in particular horses, at every moment of movement. This discovery explains why Degas created sculptures of horses, transmitting complex movements such as lifting, bending and turning of the head , pulling the hind legs and run forward , in various embodiments , even when four feet off the ground . At the same time continued to work on Degas dancers , bather and sitting figures. Most innovative work from his series of bathers - " Bath ". Perhaps this is the first in the history of fine art sculpture, designed for viewing from above . « Little fourteen- dancer " became even more radical departure from tradition. At the head of the statue was wearing a wig of real hair , tied with a satin ribbon on them . Wax figure was dressed in a dress from these fabrics: linen bodice, gas pack and satin ballet shoes on his feet. Years later, follow the example of Degas , Marcel Duchamp and many others . Soon after his death the heirs found in his studio 150 wax sculptures , eighty of them were in good condition. It was decided to cast seventy four of them in bronze, and these models firm " Hébrard » («Hebrard») produced a certain number of castings. This proved to be a wise decision : if they were not cast in bronze , the most important sculptural heritage of the artist would have remained forever unknown. The main subjects of these works - so they were widely praised dancer in motion, the horse in motion and at rest, bathers and seated figures . It casts such unauthorized artist Degas sculpture is represented in many museums around the world . Wax models , which were made from castings , and more have been sold as far as we know, have not been used for the manufacture of bronze options . Some time ago, in the foundry " Valzuani » («Valsuani»), largely inherited materials workshop " Hébrard " plaster models were found , possibly made ​​from the original wax , before the last transfer to new owners. On the basis of these models was cast new series of bronze sculptures , which, like the previous ones, is not authorized . These new castings caused much controversy - from accusations of forgery to protest against the excessive replication . State Hermitage Museum held a special symposium in 2012 , dedicated to the " posthumous " bronzes , during which discussed the problem of replication authentication and later castings , which exists widely and , although most of the concerns of contemporary sculpture , and affects a significant part of the sculptural works of previous centuries . The results of this symposium and led today to organize an exhibition of the Hermitage , where the problem would be represented in a dynamic way to show an interested audience all its aspects . Losing work without a confirmed name its aesthetic value or not? The answer to this question can prompt the Hermitage exhibition , where samples of castings and workshop " Valzuani " and workshop " Hébrard " from the collection of the M. T. Abraham . According to M. Piotrovsky , Director General of the State Hermitage Museum : " The main purpose of the exhibition - to recall the wonderful sculptures by Degas, and today the full aesthetic riddles. They anticipated many modern and future art. However, the exhibition is designed to sharpen and raises some general questions that create the atmosphere in which there is contemporary art ». exhibition curators - SO Androsov , head of the Department of Western European Art of the State Hermitage , Doctor of Arts , MO Dedinkin , deputy director of the Department of Western European Art , IG Etoeva , Researcher, Department of Western European art of the State Hermitage Museum, and Dalit Lahav - Durst , chief curator of the Foundation named after M. T. Abraham . The exhibition illustrated catalog (published by " Petronius ', 2013 ), which includes introductory Mikhail Piotrovsky and Amir Kabiri Gross , President of the Foundation named after M. T. Abraham . Authors - Geraldine Norman , John Whiteley , June Hargrove , Dalit Lahav - Durst .